The Black Canyon is deep, narrow canyon formed by the Gunnison River whose schist and gneiss walls give it its dark appearance. 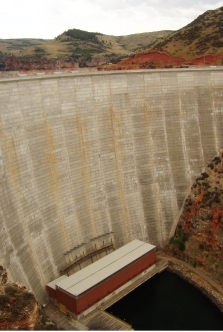 The nearby Curecanti NRA consists of three reservoirs created by the downstream damming of the Gunnison. The Black Canyon is unreal. At most, of the overlooks, the opposite rim stands less than a quarter-mile away. Then you look down. The head gets dizzy, the stomach rises, the knees wobble and fear sets in. The drop never stops, falling 2,750 feet at the deepest point. The white water down below roars with same decibels as a jet airplane. The canyon walls really are black. Streaks and striations of grey and white give the walls and unbending character. The Canyon’s narrow demeanor causes constant optical illusions. The walls blend, the sides become one, the gorge disappears. The Canyon wishes to be unseen. It never beckons, never asks you to hike down. It cherishes its mystery and wants to be left alone. Humans have lived in the area for 10,000 years but no one traversed through the Black Canyon until 1901; it had been too steep and too menacing. A train display at Curecanti NRA’s Cimmaron Visitor Center showcases the area’s role in the Denver and Rio Grande Railroad’s Scenic Line of the World. The moderate-sized crowd did not affect our stay at the Black Canyon, an auto-tour style park. These Parks are located in the central portion of western Colorado. They both sit along U.S. Route 50 between the towns of Montrose to the west and Gunnison to the east. The Black Canyon VC is 90 miles to the southeast of Interstate 70 at Grand Junction via Route 50. Route 50 continues eastward meeting up with I-25 at Pueblo, 200 miles east of the Black Canyon. The circuitous 250 miles northwest from the Black Canyon to Denver travel up, in, through and around the Rocky Mountains. Have fun. We had a great time browsing through Black Canyon NP’s huge book selection. Did you know that there are at least 50 books published about Rocky Mountain wild flowers? We did not. Michael’s mother owns most of the children’s books for sale there, including a few classics: Ten Little Rabbits, Owl Moon and The Lorax. Her kindergarten classroom does not include Sunshine on My Shoulder, a children’s book based on John Denver’s touching song. We really should have bought it for her. Darn. The store sells the actual United States Geological Service maps and surveys of the Gunnison Canyon and gorge. How cool is that. If you are having trouble understanding what is on those maps, the store sells more than a dozen books that explain the Canyon’s geology. Black Canyon NP entry is $8 per vehicle, free with the National Parks Pass. Curecanti NRA is always free. If you want to launch a boat, its $4 for two days. One Ranger and one Electronic Ranger. The nearly 30-minute Park introductory film dives head first into the Park’s history. Problem is the pool is awful shallow. The Park’s history could be recounted in much less time. Sometimes the 18-minute pretty picture films are preferable. Nonetheless, the film’s pictures of the canyon are beautiful and done with the help of a brave helicopter. But who needs pictures when the natural wonder is just outside? We enjoyed meandering through Curecanti NRA’s Cimarron rail yard. Between Memorial Day and Labor Day the Park Service offers two daily $12 guided Boat tours at Curecanti NRA. The boat ride begins at the Pine Creek boat dock, travel through the upper Black Canyon and allows for lake-level views of the Curecanti Needle. Sounds like fun to us. road leads down to the Canyon’s East Portal. Make sure your brakes are in order before you make the 2,000-foot descent with 16 per cent grades and hairpin turns. From the East Portal, you are on your own. Only experienced kayakers should proceed; the River is classified as Class V to unnavigable. The Black Canyon’s floor remains a mystery to all but the most skilled. There are no hiking trails down, no helicopter flights in and no super elevator rides. You must use your imagination from your distant rim perch. The Curecanti NRA allows for more accessible water-related fun. The Black Canyon of the Gunnison is every bit as awesome as Arizona’s Grand Canyon. Michael had traveled to both canyons prior to our journey. In fact, one of the trip’s motivations was to climb down to the bottom of both. He did not realize that you cannot hike down the Black Canyon. He does now. The Auto Tour allows for terrific views of this magnificent geological wonder but ultimately your brain cannot comprehend the depth and colors of the canyon. You want to be overwhelmed but the scenery looks more like a painting than an actual object of nature. The Black Canyon is stunning but after both visits Michael left wanting more. 53 miles of protected river that cuts a profound gorge into the mountainous countryside. The New River boasts both excellent fishing and challenging whitewater. Alongside the river’s borders lie the remains of once great railroad towns and abandoned coal mines. The most beautiful place we have ever seen in the eastern United States. The trees are lush; the water is a warm 75°, the gorge dramatic, the river intense. Mist hovers above the water, exposed sandstone rock juts out from sheer cliffs, every bend in the river brings a stunning view. The New River Gorge Bridge, America’s second highest bridge crosses the canyon just south of Park’s northern River border. The man-made structure spans the River with a regal presence. The New River Gorge feels like the tropics. Our entire boat vocally wondered if we were in a jungle. Maybe it was the three inches of rain the previous night or perhaps it was the inch that fell during our trip’s first two hours. It could have even been the hundreds of vultures sunning themselves in trees alongside the riverbank or even the intense greens of the flora. For us it was the smell, a smell of sticky growth and untold excitement. We all felt like we were in an adventure movie and a treasure was just around the corner. Reminders of King Coal emanate everywhere along the River. You see abandoned mine shafts and black veins on the exposed gorge rocks. Still-working coal-carrying trains roar through the valley on the river’s edge. A once-thriving resort town and coal center, Thurmond, lies within Park boundaries. The town’s grand brick structures stand in ruin along the banks lending an eerie historical charm to the adventure. The New River also enjoys a significant natural significance: it is the world’s second oldest river, junior only to the Nile. On the ride to the departure spot, a river guide stressed to a busload of eager rafters, “Get to know the person next to you. Make friends. They could be the one pulling you out of the water.” Once we launched into the New River, our guide, Wriston, introduced our boat of nine whitewater neophytes to the basic rafting techniques and to each other. Both introductions were equally important. Over the course of our six-hour trip we would get to know each other real well. We paddled together, worked through difficult technical rapids together, ate together, swam together, pulled each other out of the boat together and after the trip was over, drank soda and beer together. Our nine ranged from ages 13 to 60 with wide ranging geographical and life experiences. We quickly bonded as a team, faced difficult challenges and had a rip-roaring time. The Park, while close by Interstates 64 and 77, is demonstrably prohibitive. To fully experience the River, you need to be on it. Unless you are an experienced kayaker, the difficult Class III through Class V Rapids (VI being the most difficult) must be tackled with an outfitter and on a whitewater raft. If you are just fishing, road access to the New River’s banks is challenging. Once you leave U.S. Route 19, the roads pare down to a narrow tortuous unmarked one lane. Be very careful if you are driving at night. Scenic views from above do exist at and around three of the Site’s four Visitor Centers. The NPS bookstore was not too unique. 20 different whitewater outfitters operate nearby the New River. Full-day trip prices range anywhere from $75 to $95 per adult. We stumbled upon a $62 Tuesday-only rate from Appalachian Whitewater and left ecstatic with the product we received. If we were to return, we would use the same company. Half-day trips are available from some outfitters. The National Park Service takes a backseat to the many outfitters at the New River Gorge. It is probably for the best. There is no way that the federal government could offer a whitewater rafting excursion. This is not to say that the Park Service exists sight unseen at the New. There are four Visitor Centers which provide information and give cursory explanations of the New. Our biggest complaint about the NPS Visitor Centers is their hours. They are all open from 9-5. Sounds fine, right? Sure, if you are just driving through the area and only want to look down into the Gorge. However, the full day rafting trips take place roughly from 9-5, making a VC visit impossible. The NPS offers free camping at four separate campsites. We stayed at the Stone Cliff Campsite, a few miles from any VC. We arrived at 5:30 and were dismayed at the lack of any Ranger presence, especially since we were along the New’s riverbanks, it rained over three inches, there was no cell-phone service, the roads to and fro were extremely narrow and we were in the middle of Appalachia. If the Visitor Centers stayed open a few more hours, they would greatly increase the numbers of people who need to use their services. We could not have asked for more from our Tour Guide, Wriston. He gave us a great trip, a comprehensive West Virginia and New River Gorge history, plenty of corny jokes and an intensive lesson on how to whitewater. Our safety and well-being lay in his hands and on his commands. We never felt in danger. We have gained a burning desire to whitewater again as well as the confidence to attempt more difficult waters. Like the nearby (and much more difficult) Gauley River in September. It is a National Recreation Area and consistently rates among the Top 5 whitewater trips in the world. Wriston asked for a volunteer. Of course Gab blindly offered her services. Her mission: Sit on the front of the boat through a Class IV Rapid, hold on with one hand while waving with the other. Pretend you are riding a bull. She succeeded, screaming and yelling through the entire thing while the entire boat wished they had volunteered first.